(Nanowerk News) An international team of scientists have become the first ever researchers to successfully reach temperatures below minus 272.15 degrees Celsius – only just above absolute zero – using magnetic molecules. The physicists and chemists are presenting their new investigation today in the scientific journal Nature Communications ("Quantum signatures of a molecular nanomagnet in direct magnetocaloric measurements"). It was developed by six scientists from Bielefeld University, the University of Manchester (Great Britain), and the Universidad de Zaragoza (Spain). 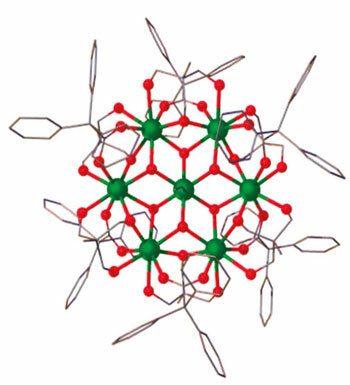 The magnetic molecule ‘Gd7’ used in the low-temperature experiment has the geometric structure of a snowflake. Scientists usually express temperatures on the Kelvin scale. Minus 272.15 degrees Celsius is precisely one Kelvin. This is why the researchers call their development ‘sub-Kelvin cooling’. Cold temperatures are generally obtained by using an effect that anyone can observe with an aerosol can. If you press the button on the can for long enough, you will notice that whatever is being sprayed out gets colder. A normal refrigerator also uses this effect. In both cases, a gaseous refrigerant cools down as it expands due to the drop from high to low pressure. But how can we reach really low temperatures in the low Kelvin range? Nowadays, this is done by using helium as the refrigerant. However, helium is becoming increasingly scarce. ‘The very rare helium-3 isotope with which one can also get down to a few tenths of a Kelvin is now practically unaffordable,’ says Professor Dr. Jürgen Schnack, co-author of the study and physicist at Bielefeld University. Magnetic substances can also be used as refrigerants. These particularly include paramagnetic salts. Their cooling has nothing to do with pressure. They cool down when the external magnetic field generated by, for example, an electromagnet decreases. When the electric current is reduced in the coil, the magnetic field also decreases and the paramagnetic salts cool down. In their article, the scientists from Zaragoza, Manchester, and Bielefeld report on successful sub-Kelvin cooling with an alternative medium – magnetic molecules. These are molecules containing magnetic ions such as gadolinium. ‘Nowadays, these can be produced in large quantities so that they are readily available compared to helium,’ says Professor Eric J. L. McInnes PhD, the head of the research team at the University of Manchester where the molecules studied were synthesized. The magnetic molecule with which he and his colleagues have been experimenting is called ‘Gd7’ in short. Very appropriately, it has the geometric structure of a snowflake. As the computer simulations by Professor Schnack‘s research team show, it starts of by cooling down in a decreasing magnetic field; then it warms up again before finally cooling down once more as the magnetic field disappears. ‘We were really excited when the theoretical computations were able to explain this complex behaviour in detail,’ says the Professor of Theoretical Physics. ‘Compared to paramagnetic salts in which the temperature drops continuously as the magnetic field declines, molecules such as Gd7 behave in more complex ways. They can be used to get down to really low temperatures without switching off the magnetic field completely,’ reports Dr. Marco Evangelisti whose team at the Universidad de Zaragoza carried out the low-temperature experiments. ‘You have to know that such simulations work with gigantic matrices, that is, special number fields. We are happy to have a powerful supercomputer in Bielefeld for this purpose,’ says Schnack. The researcher reports that the computer system is not just invaluable for the project on magnetic cooling but also for the DFG Research Unit 945 ‘Nanomagnets’, funded by the German Research Foundation (DFG).